For most of the first half of noughties, the ethics of torture was a hot topic, fueled no doubt by the political pressures of the war on terror. My sense is that the philosophical interest in torture has abated somewhat since then, although there are still books being published on the topic (e.g. Frances Kamm’s recent work). I remain interested for a variety of reasons. Some of those relate to teaching and the use I make of ticking bomb arguments in introducing students to argument analysis, but some of them have to do with my research which is partly focused on how different epistemic systems and practices are used in the law. In keeping with this latter interest, this post will take a look at something I call the “epistemic objection” to torture. There are many ethical objections to torture, but there are also some (arguably compelling) ethical justifications of the use of torture in rare circumstances (“ticking bomb scenarios”). I have discussed these justifications before. The thing is, these justifications are usually premised on the belief that torture will actually be an effective means of obtaining information that will allow us to avert some disastrous consequence. But this is exactly what the epistemic objection disputes. It argues that torture is actually a highly unreliable source of information. If this is right, then most of the ethical debate over the harmful and disastrous consequences of torture is irrelevant. No doubt many reading this will have encountered something like the epistemic objection in their travels (and travails) through the torture debate. It is often supported by reference to historical studies of, or historical experience with, the use of torture to extract information. This empirical work is of great importance, but there are also some theoretical reasons for thinking that torture would be a poor source of information. These reasons stem from something known as “Epistemic Systems Theory”, a relatively recent theoretical framework developed by the economist Roger Koppl. Indeed, Koppl used the epistemic objection to torture as one of his case studies in his initial presentation of this framework. In this post I want to look at Koppl’s analysis and show how it can be formulated into a rigorous and complex argument against the use of torture. In doing so, I will eschew most of the mathematical formalisms adopted by Koppl in his discussions. These formalisms are fascinating and richly rewarding to the patient reader, but presenting them here would take too much time. Instead, I will attempt to present a more qualitative, reader-friendly version of the objection. The interested reader can go to Koppl’s article for the full formal machinery. The discussion shall be split across two posts. In this post, I will present the basic epistemic argument against torture, and outline Koppl’s defence of its first premise. In the next post, I will turn to the second premise and consider some of the dialectical moves that are made in defending and critiquing this premise. 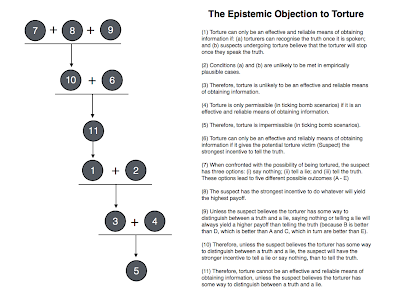 We start with the basic epistemic argument against torture. For simplicity’s sake, we shall assume throughout this post (and the next) that we are arguing against the use of torture in ticking-bomb scenarios. Although torture could be used for other purposes (punishment, sadistic pleasure, population control), none of those are likely to be justified. In the ticking bomb scenario, we have a person (or persons) in custody who we believe has information that can be used to avert some disastrous consequence (e.g. terrorist bomb going off in a populous location). 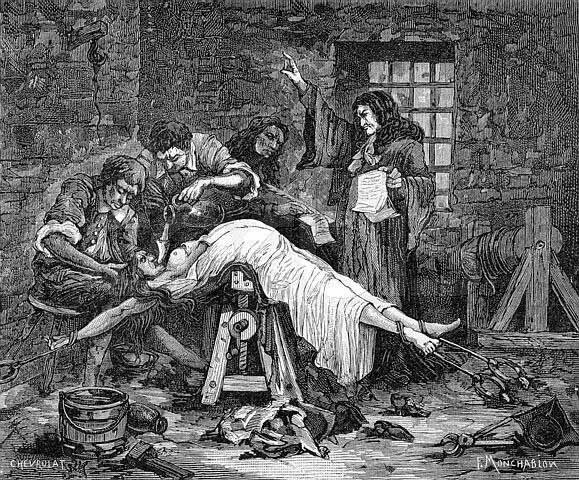 All other means of extracting or obtaining the information have been exhausted or are impractical given the time constraints involved so the idea of torturing the person so as to extract the information is floated. Under such circumstances, it could be argued that torture is permissible. At this point in the debate, in steps the proponent of the epistemic objection. They point out that the ticking-bomb argument depends on the implied assumption that torture is an effective and reliable means of obtaining the relevant information (I’ll come back to this in part two in case you think it’s not strictly true). But this assumption is dubious, to say the least. Assume, for sake of argument, that we have the correct suspect in custody. That is to say, we have a suspect who can actually provide us with the information we need. Even then, Koppl argues, torture would only be an effective and reliable means of obtaining information if two conditions were met. First, the torturer would need to be able to recognise when the suspect was giving a truthful answer. And second, the suspect would need to believe that the torturer would stop torturing them once a truthful answer has been given to them. (1) Torture can only be an effective and reliable means of obtaining information if: (a) torturers can recognise the truth once it is spoken; and (b) suspects undergoing torture believe that the torturer will stop once they speak the truth. (2) Conditions (a) and (b) are unlikely to be met in empirically plausible cases. 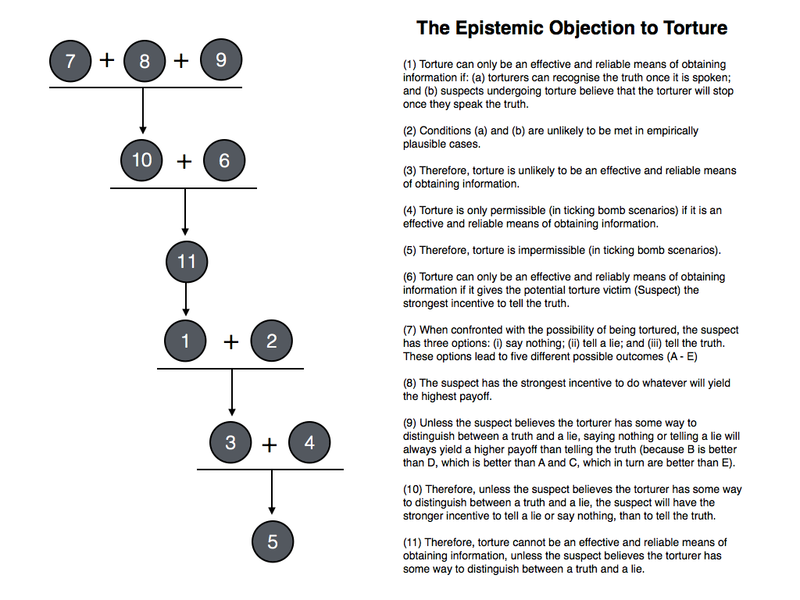 (3) Therefore, torture is unlikely to be an effective and reliable means of obtaining information (from 1 and 2). (4) Torture is only permissible (in ticking bomb scenarios) if it is an effective and reliable means of obtaining information. (5) Therefore, torture is impermissible (in ticking bomb scenarios) (from 3 and 4). This argument looks to be valid, so the question is whether its premises are true. Some of them might seem straightforward enough, but I want to take a closer look. In the remainder of this post, I’ll focus on premise (1). Next time round premise (2) will be the main attraction, but premise (4) will also get a little look in. The first premise of the epistemic argument may seem obviously true. Certainly, I’ve heard claims similar to it floating around in the media and popular debates. But it’s worth getting into its defence for at least two reasons. First, its worth knowing something about the psychological and logical mechanisms that make it plausible, since they have relevance to other debates too. Second, doing so allows me to expose you to some the formal machinery that underlies Koppl’s theory of epistemic systemics, which is worth knowing in and of itself. Koppl’s framework for understanding epistemic systems is grounded in a combination of decision theory, game theory and information theory. In order to engage with the torture example, we only really need to look at the decision theoretical limb of the framework. Essentially, Koppl argues that when a suspect (with the relevant information) is about to be tortured, they face a simple decision problem: (i) they can say nothing, and be tortured; (ii) they can tell a lie, and hope they are believed; or (iii) they can tell the truth, and also hope they are believed. Each of these choices can lead to a number of different possible outcomes. There are five of these. One outcome is associated with the first option of saying nothing, and then four are associated with the options of telling a lie or telling the truth. Why four? Because each of these options can arise under two conditions: one in which they are believed by the torturer and one in which they are not. We shall attach payoffs to each of these outcomes. For present purposes, these payoffs will simply represent the ordinal preferences of the suspect over the different possible outcomes. In other words, the numbers are strictly arbitrary and cannot be used in any expected utility calculations. Ideally, the decision problem should be modelled using expected utility theory, but that would make it slightly more complex and I’m pretty sure the gist of the argument can be appreciated without it. Outcome A: If the suspect says nothing they will be tortured but they will have remained true to their cause. This gives them a payoff of −0.5. Outcome B: If the suspect tells a lie, and the lie is believed to be the truth, they will not be tortured and will remain true to their cause. This gives them a payoff of 1. Outcome C: If the suspect tells a lie, and the lie is not believed to be the truth, they will be tortured but will have remained true to their cause. This gives them a payoff of −0.5 (same as outcome A). Outcome D: If the suspect tells the truth, and it is believed to be the truth, they will not be tortured but will have betrayed their cause. This gives them a payoff of 0.5. Outcome E: If the suspect tells the truth, and it is not believed to be the truth, they will be tortured and will have betrayed their cause. This gives them a payoff of −1. (6) Torture can only be an effective and reliable means of obtaining information if it gives the potential torture victim (Suspect) the incentive to tell the truth. (8) The suspect has the strongest incentive to do whatever will yield the highest payoff. (9) Unless the suspect believes the torturer has some way to distinguish between a truth and a lie, saying nothing or telling a lie will always yield a higher payoff than telling the truth (because B is better than D, which is better than A and C, which in turn are better than E). (10) Therefore, unless the suspect believes the torturer has some way to distinguish between a truth and a lie, the suspect will have a stronger incentive to tell a lie or say nothing, than to tell the truth (from 7, 8 and 9). (11) Therefore, torture cannot be an effective and reliable means of obtaining information, unless the suspect believes the torturer has some way to distinguish between a truth and a lie (from 6 and 10). I appreciate this isn’t a perfect defence of premise (1), but I think it’s close enough to work (and in any event (1) could be reformulated in order to be a better fit with (11)). The premises don’t appear to be too controversial to me. The only potentially controversial point I can think of is the suggestion that a committed terrorist would follow the axioms of rational choice. Some might argue that such people are irrational. Is this plausible? Perhaps, but that kind of irrationality would probably only concern the content of their beliefs and desires, not whether or not they have transitive preferences that they seek to maximise. The argument given above only assumes rationality in terms of transitive preferences, not rationality of beliefs and desires. So there shouldn’t be an issue here. This brings us to the end of part one. To sum up, one way in which to undercut those who think that torture is permissible in certain extreme cases is to challenge one of their key assumptions, namely: that torture is an effective and reliable means of obtaining information. Such a challenge can be mounted in the form of the epistemic argument that was given above. This argument maintains that, in order for torture to be effective, the torturer must be able to recognise the truth and the torture victim must believe that the torturer will stop once the truth has been spoken. This is the basic principle for epistemic reliability of torture. The problem is that the conditions stated in that principle do not hold in empirically plausible cases. In this post we have seen how one might defend the basic principle underlying the epistemic argument. In the next post we see whether it is true to say that the conditions highlighted in that principle do not hold in empirically plausible cases.